Ganesha, the god of good fortune and wisdom, is one of the most popular Hindu deities. People call upon him at the beginning of any task, because his blessing supposedly ensures success. Ganesha is portrayed as a short man with a pot belly, four hands, and an elephant's head with one tusk. He is the son of Shiva, the Hindu god of destruction, and his wife, Parvati. Ganesha, the Hindu god of good fortune and wisdom, appears here with the head of an elephant. He is seated on a throne flanked by two lions. Several legends tell how Ganesha came to have an elephant's head. One says that Parvati was so proud of her son that she asked all the gods to look at him, even the god Sani. Sani's gaze burned to ashes everything he saw, including Ganesha's head. Brahma, the god of creation, instructed Parvati to give her son the first head she found, which turned out to be that of an elephant. According to another account, Shiva struck off Ganesha's head and later attached an elephant's head to his son's body. 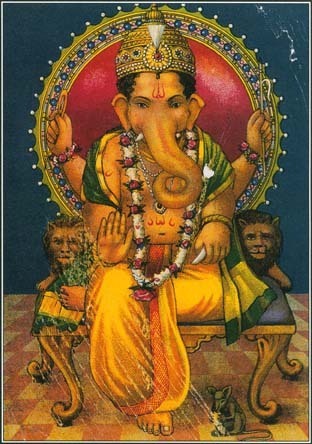 Ganesha's single tusk is also the subject of various stories. In one tale, he lost his second tusk in a fight with Parasurama, a form of the god Vishnu*. Another myth claims that Ganesha lost the tusk after using it to write the epic the Mahabharata . See also Hinduism and Mythology, Mahabharata, the . I want to know the diff beteen Ganesh having his Trunk bent on the left side and having it on the right side.